“Lie bumps” is a common name for transient lingual papillitis. 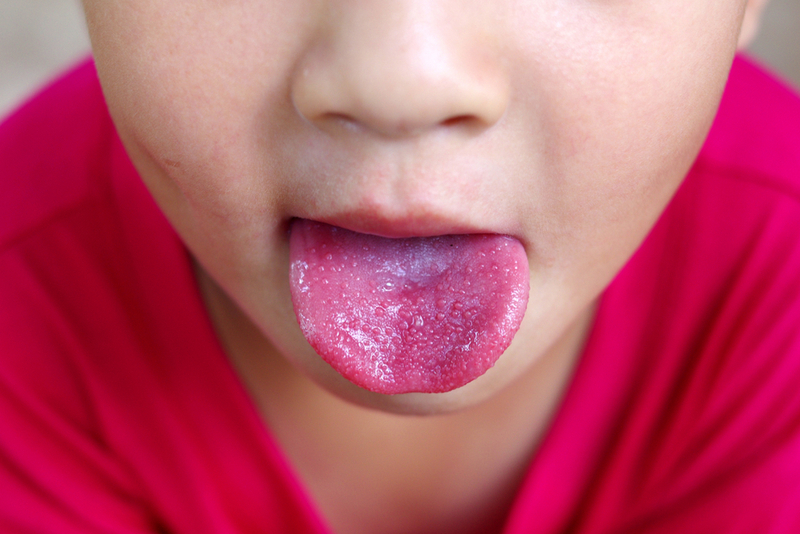 The common name derives from a superstitious belief that telling a lie causes these bumps to appear on your tongue. The name is still used even though we know this is not the real cause. These bumps are typically small, red or white, and may be painful or uncomfortable. They appear suddenly and generally disappear in a few days. In most cases, no treatment is necessary. If these bumps appear alongside other symptoms, you might have “eruptive lingual papillitis," which is caused by a virus. They are most commonly found in children. If they persist for more than a week, it is wise to see your dentist or doctor. If these bumps recur in children, it is wise to see their pediatrician. It can last as long as two weeks. It may be caused by a virus. It may cause swollen glands. It may be accompanied by fever. CAUSE: Scientific research has not been able to identify or document a definite cause of lie bumps. A number of possible causes have been advanced, including: stress, gastrointestinal upset, menstruation, acidic food, sour food, food allergies, spicy food, smoking, and local trauma (e.g., biting or burning the tongue). They are often caused by the taste buds splitting. Avoid acidic, sour, or spicy food. Rinse the mouth with salt water. Use mouthwash to reduce bacteria in the mouth. WHEN TO SEE A DOCTOR: There are several types of bumps that can appear on your tongue, each with its own cause. If you have bumps that are not caused by transient lingual papillitis (lie bumps) or eruptive lingual papillitis, you should see your dentist or doctor. Other bumps might be caused by human papillomavirus (HPV), canker sores, syphilis, scarlet fever, oral cancer, traumatic fibroma, or lymphoepithelial cysts. What is Strawberry Tongue? What do I need to know and do? My dentist told me I have strawberry tongue and referred me to my primary care physician. Strawberry tongue is often assumed to be a dental or oral health issue. It is a symptom of one of several diseases. It should be treated immediately by your primary care physician because some of the underlying diseases can be serious. 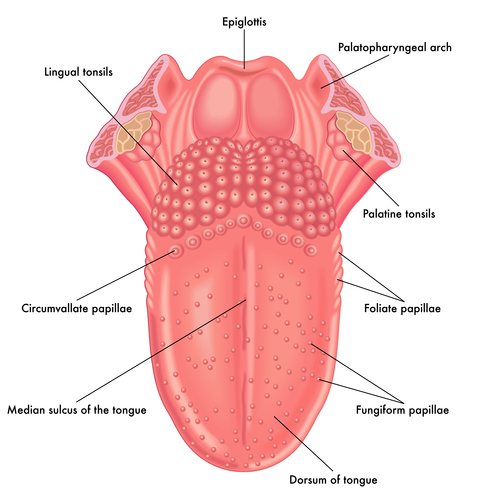 Among the most common causes of strawberry tongue are the following conditions. Food or medication allergy. In these cases, the reaction to the allergen causes your tongue to become inflamed and swollen. Typically, antihistamines will be prescribed to control and reduce the allergic reaction. If the allergic reaction is serious – anaphylaxis – it may be accompanied by other symptoms such as swelling of the throat or face, difficulty breathing, chest pain, rapid heart rate, low blood pressure. Anaphylactic shock can cause problems with breathing and with the circulatory system. Untreated, it can be fatal. Kawasaki Disease. Kawasaki disease typically occurs in children. It causes particular arteries to become inflamed and swell. Other symptoms of Kawasaki Disease include: high fever, skin rash, red eyes, peeling skin. Without treatment, it can cause a coronary artery aneurysm or other heart problems. Scarlet Fever. When a bacterial infection develops in someone with strep throat, it can cause scarlet fever. The disease most often affects children between the ages of 5 and 15. Other symptoms of scarlet fever include: red rash covering much of the body, high fever, bright red areas in the folds of the skin, headache, sore throat, flushing of the face over the cheeks. Without treatment scarlet fever can cause a person to develop rheumatic fever, kidney disease, skin infection, serious infection of the middle ear, abscesses, or lung infection. Toxic Shock Syndrome. Toxic Shock Syndrome has been connected with nasal gauze packing and with use of tampons. It is most commonly caused by the bacterium Staphylococcus aureus or the same species of group bacteria A Streptococcus. The latter causes Scarlet Fever. The tampon creates a host for growth of the bacteria. In addition to strawberry tongue, Toxic Shock Syndrome can cause other symptoms, including: high fever, headache, aches and pains, sore throat, nausea, vomiting diarrhea. Toxic Shock Syndrome should be treated immediately. Without proper treatment, it can be life-threatening if it affects vital organs. Vitamin B12 Deficiency. Strawberry tongue can also indicate the vitamin deficiency. It will typically be accompanied by other symptoms, including: weakness, tiredness, numbness or tingling, memory problems, balance issues, or glossitis. It is treated easily with high doses of Vitamin B12. Strawberry tongue, as the name implies, causes your tongue to resemble a strawberry (red and swollen with bumps). Alone, it is not an illness. Instead, it is a symptom of underlying diseases. It is not a dental or oral health issue. Some of these diseases are quite serious and can be fatal. However, all of these diseases can be treated effectively by your primary care physician. We recently shared with you some information about the decline in cigarette smoking among U.S. adults. In that post we observed that teen use of tobacco products was escalating. The increase in teen use of e-cigarettes is alarming. In data released this month (much earlier than expected) documents a staggering increase in the popularity of e-cigarettes among teens in America. Data released by the Food and Drug Administration (FDA) and the Centers for Disease Control and Prevention (CDC) suggest that the use of e-cigarettes has reached epidemic proportions. In 2018 more than 20 percent of American high school students reported using e-cigarettes regularly. This is almost twice as many teens as in 2017. This increase in use of tobacco products was attributed to a “dramatic” rise in e-cigarette use over the last year. Equally alarming is the fact that these teens are using e-cigarettes more often. Nearly 30 percent of the high school students who reported use of e-cigarettes said that they had been vaping with an e-cigarette at least 20 of the last 30 days. Particularly popular among teens are the small e-cigarettes that resemble a USB flash drive. These devices contain very high amounts of nicotine and are most popular in fruit and candy flavors. The flavors are significant. For many teens, the flavor was the initial draw to trying e-cigarettes. These flavors then increase the likelihood that those who try the e-cigarettes will graduate to regular use of the products. Use of these e-cigarettes can be highly addictive (due to the amount of nicotine they contain). They also carry the risk of harm to breathing and to oral health. Many experts are concerned that the progression from e-cigarettes to combustible tobacco products will be a small step. That step would subject a new generation of Americans to the harmful effects of cigarettes and other tobacco products. We can expect to see programs coming from the FDA and the CDC to attempt to curb this rise in the popularity of e-cigarettes. The carcinogenic properties of tobacco will bring more cases of tobacco-related cancer, heart disease, lung disease, oral health issues, and more to this new generation. Society will continue to be saddled with the ever-rising cost (human and financial) of these diseases. You can prevent and fight off cavities with the coffee you love so much. Worldwide, we consume 10.5822 pounds of coffee per person per year, on average. Dentists tell you daily that coffee can stain the enamel of your teeth. Now we know that drinking coffee can be good for your teeth and your overall dental health. While you drink your next cup of coffee, let me explain. First, it is important to emphasize that we are talking about coffee without additives. This means black coffee, without sugar or sweetener and without milk or cream. Second, these benefits are derived from roasted coffee. Most of us drink roasted coffee, both at home and in coffee shops. Specifically, medium-roasted coffee has the greatest benefit for your teeth. Medium-roasted coffee has the maximum level of antioxidant activity and an antibacterial activity that prevents even Streptococcus mutans from attaching to your teeth. This is a primary bacterium in causing cavities. 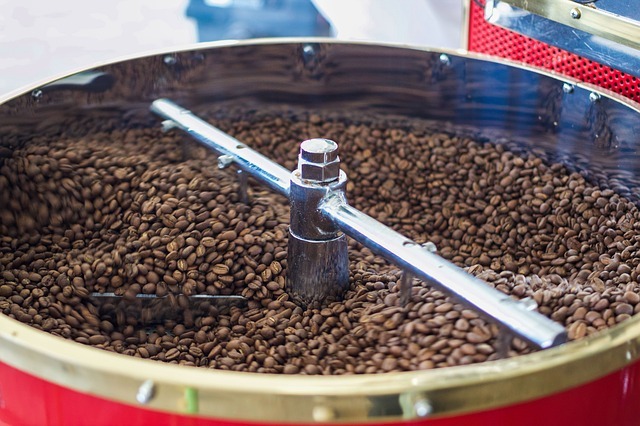 When coffee is roasted, some compounds are formed that do not form under other circumstances. Those compounds include melanoidins (polymers that form in food only at high temperatures). When you drink coffee (without additives) these characteristics prevent the bacteria that cause cavities from attaching to your teeth and causing damage. Many people are surprised to learn that coffee drinkers typically have whiter teeth than others. This is true despite the tannins in coffee that can stain teeth (like cola drinks or wine). These stains, though not removed by additives in toothpaste, can be addressed by your dentist. What about people who use additives in their coffee? Milk alone will not interfere with the positive effects of coffee for teeth. However, a mixture of milk and sugar or artificial sweetener will reduce the effect of these characteristics of the coffee and allow cavity-causing bacteria to form on tooth surfaces. Drinking a moderate amount of coffee with no additives can have a positive effect on your dental health. The coffee prevents certain cavity-causing bacteria from attaching to your teeth. How do you drink your coffee? Will you continue to use additives, or will you switch to black coffee?